We all have threading errors from time to time. This time I completely transposed the threading on shafts one and two. 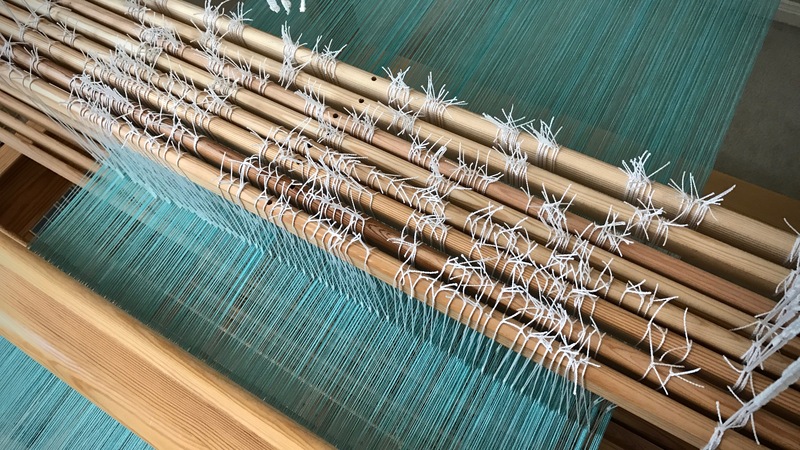 I saw the error when I started weaving; the pattern in the cloth was not as it should be. After a few days of contemplating, arguing with myself, and studying the error, I decided on an ingenious and risky fix (I hinted at it in My Best Weaving Stunt to Date!). Switch the two mis-threaded shafts. Yikes! One slip up could bring the whole warp down–figuratively and literally. I caught myself holding my breath several times through the process. Gently hopeful, but not 100% sure that my plan would work. Thankfully, it did work. Shafts 1 and 2 (counting from back to front) have been threaded incorrectly. Shaft 1 should be 2, and 2 should be 1. Shaft bars 1 and 2, upper and lower, have been switched. The operation was similar to transferring lease sticks in the back-to-front warping process. Here’s a short video that shows the maneuvers I did to correct the error. No re-threading needed! The kuvikas square within a square wins! May you be brave enough to take appropriate risks when needed. Whoa! That was some ingenious maneuvering! Hi Beth, It was all very logical, but a little scary at the same time. Brilliant! Of course in the video it looks completely smooth and safe! The dramatic music helps to relate some of the risk that was involved, however. Julia, It makes me smile that you mentioned the music. I was hoping the music would help convey that risk factor. I did feel quite accomplished when I finished the operation and found it worked! A quick thought, if shaft 1 and 2 are in the wrong threading sequence, why not change the tie-up. Risk factor very low. Having actually dropped shafts (don’t ask), I am not brave enough to do it on purpose! Kudos!! Hi Marcia, I have *almost* dropped shafts before, so I know how it can happen! But this was not much different than transferring the lease sticks to the back of the reed. That always makes me nervous, too. Every step, I stopped, looked, and thought it out before making a move. My question was just like Marie’s. Seems like a much easier way to go. Maybe the fact that you were on a countermarche loom made this more complex???? But your fix was impressive!! Hi Ellen, I’m afraid NASA wouldn’t want me. My math skills are just strong enough to plan a weaving project, and not much more than that. But, if they need someone to move heddles around, they can call me. Now, that made me hold my breath! Well played…..
Karen, It’s not something I want to do very often! Whew, I was holding my breath just watching the process. Well played! Martha, These Swedish countermarch looms are so adjustable and flexible, otherwise it wouldn’t be possible at all. I’m glad I have Texsolv heddles! Well done. Clever girl Karen. Thank you so much for sharing! Hi Alison, Problem solving never gets old! I don’t think this would work with a jack loom with solid frame shafts, do you? But maybe changing the tie up would be easier on that kind of loom, too. Anyway, I was proud that I thought of changing the tie up even before reading the comments! And, actually, couldn’t figure out even with the video just how you did it. I won’t even ask how you happened to make such an error…just thank you for sharing that you did! Hi Nanette, You’re right, this wouldn’t work with a jack loom with solid frame shafts, or with metal heddles. Hopefully, you’ll never make this kind of mistake, but changing the tie-up should work. I don’t know how I made that mistake, either. My brain was just thinking in reverse for those two shafts. It took me quite a while to even see the error, because my brain kept seeing the two sets of heddles in reverse. I’m totally confused, not unusual. Was what you were doing was moving the heddles from S1 forward to S2’s position and S2’s heddles back to the S1 position by putting the heddles on a temporary stick and dragging them forward or backward and then re-inserting the shaft stick? Don’t the heddles and the temporary stick get hung up on the other heddles or the warp? I’m astounded! Very well done indeed. Joanna, You described it perfectly! That’s exactly what I did. I only had to put in a temporary stick (a warping slat) on the first shaft heddles. Then I could move the second shaft to the first shaft place. I then repeated the process under the warp. The only things that got in the way were the shaft bar cords that hold the upper shaft bars. I undid them and reconnected after the transfer. And the shaft-to-lamm cords under the warp had to be released, and then reconnected. 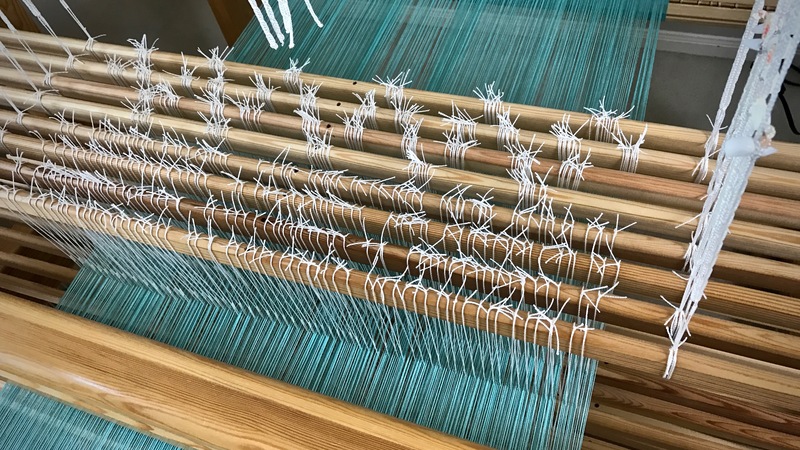 I decided to do it when I surveyed the situation and thought, if only I could just slide those heddles forward on the warp, and slide the others back. That got my wheels turning. My Best Weaving Stunt to Date! Skeleton Tie-Up on a Countermarch?